Home / Highlights / GEP VET FINAL CONFERENCE – YOU ARE INVITED! Believe it or not – our exciting project has come to its end! The past 2 years have been really dynamic and very fruitful – our GEP VET team of experts from Germany, Slovakia, Portugal and Bulgaria identified altogether 18 most relevant entrepreneurship competences across Europe, on that basis we created 18 trainings modules and we developed and launched our main product – the GEP VET Online Toolbox – the web home of entrepreneurship (http://toolbox.gepvet.eu/). In addition, our GEP VET community grew further with the dozens of European trainers who were involved in our Train The Trainer seminars and launched the GEP VET modules in their organisations. And all this with one major aim – to foster entrepreneurship culture among VET teachers and trainers, labour market and in-company trainers, on the one hand, and on the other hand to promote entrepreneurial mind-set and behavior among learners in VET, employees and people in labour market courses. 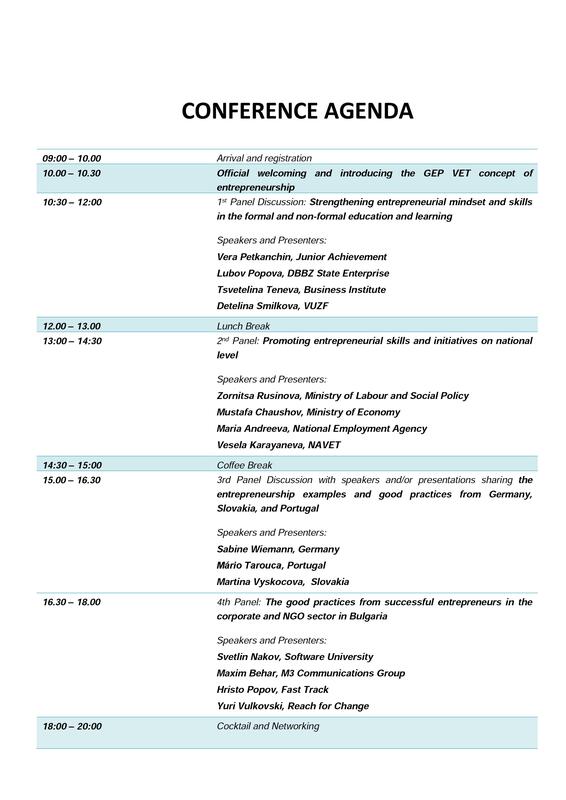 The final GEP VET conference is an important milestone in the fulfilment of the goal of the project, where the GEP VET mission of encouragement of the entrepreneurship potential will be spread among an audience of EU agencies, governmental bodies, international experts, corporate figures, entrepreneurs, public figures etc. For a detailed programme of the conference, please see below! in Hotel NOVOTEL, Sofia, Bulgaria. Join us to celebrate the future of entrepreneurship together! We are looking forward to welcoming you on the Final GEP VET Conference!